After a visit to the Lougheed Staples in Burnaby, we were in need of nourishment. 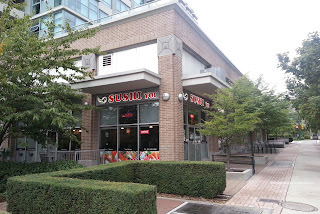 One look at the adjacent Sushi Garden and we were not going to line up for mediocre Japanese fare. We already did that recently! As much as Church's Fried Chicken offered up another option, I had to resist. The solution? Drive up a block over to Rosser and visit Sushi Yoi in the former location of Chinese restaurant and another Japanese restaurant before that. 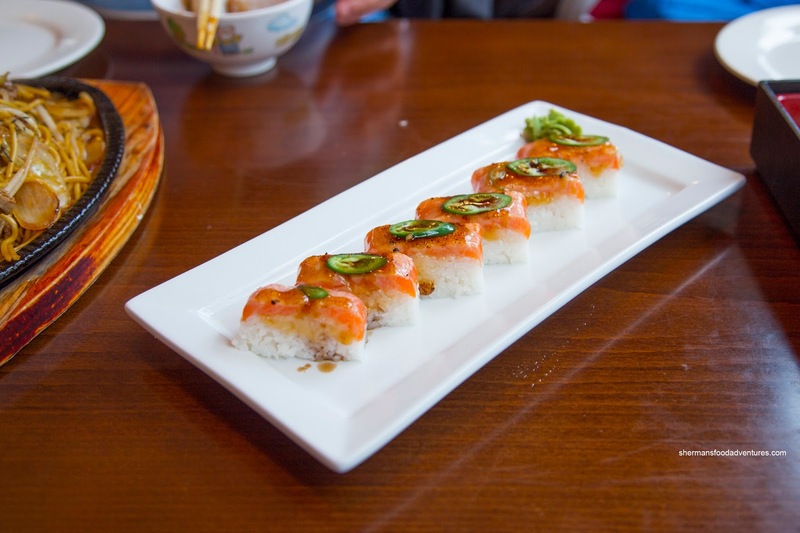 Whenever I see Aburi Salmon Oishi on a menu, it conjures up memories of the fantastic version served at Miku. 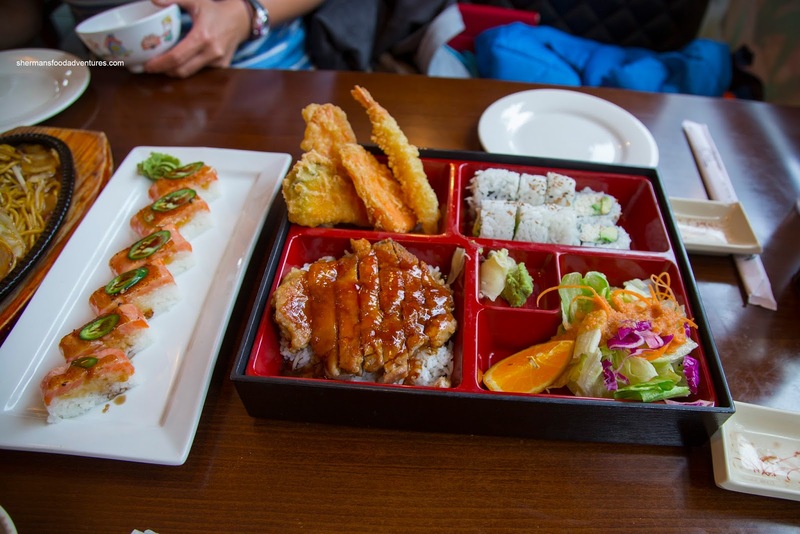 Priced at only $7.95, it was a no-brainer for us to order it. You know what? It was actually pretty good with buttery soft and slightly charred salmon with the usual sliver of jalapeno on top. Unlike Miku, the sauce here was more subtle and vinegary. We thought the rice was a bit soft, but it didn't make or break the dish. 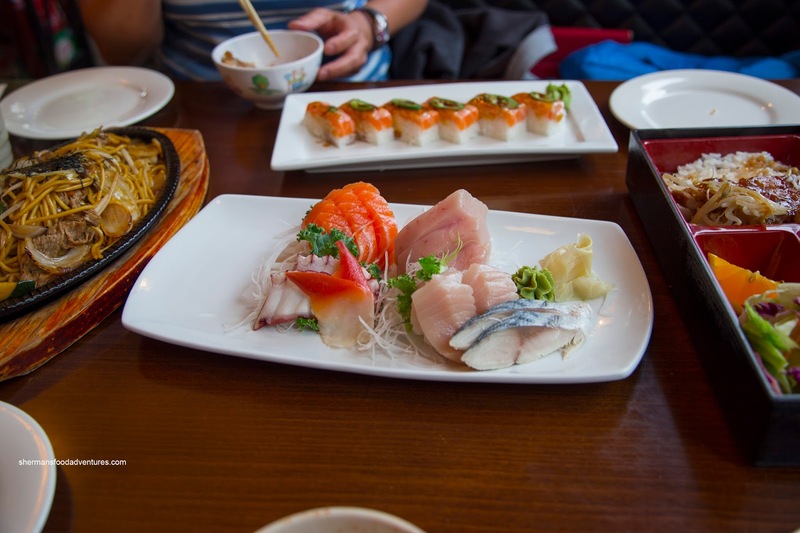 Next up, we had the Assorted Sashimi consisting of Atlantic salmon, albacore tuna, toro, tako, hokkigai and mackerel. This was decent with nicely textured tako which was tender with an appealing chewiness. On the other hand, the tuna was not completely defrosted, so it was really cold and a bit stiff. 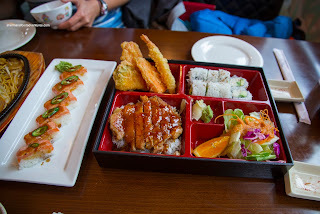 The kiddies ended up sharing the Bento Box with teriyaki chicken, tempura, California roll and green salad. Either my son really loved the teriyaki chicken or he was famished because he dusted it off. I was able to try some of the chicken and it was moist with a crispy exterior. There was a modest amount of sweet teriyaki sauce on top. As much as the tempura was hot and crispy, the oil was too old where it compromised the flavour of the batter. In actuality, my daughter didn't eat much of the bento box, rather, she focused her attention on the large portion of Chicken Karaage. 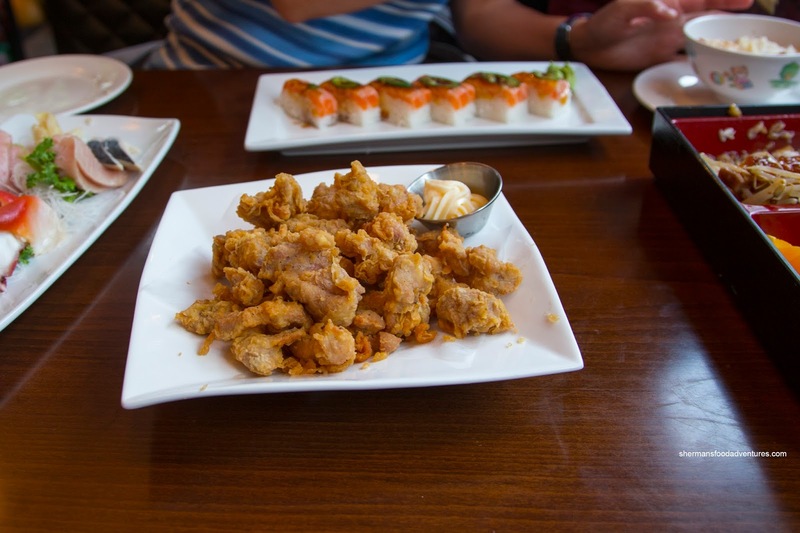 It was made with nuggets of dark meat that were coated in a light and crispy batter. Moist and tender, the chicken was also lightly seasoned (including the batter). 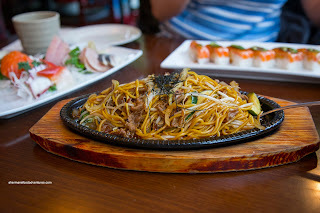 Arriving on a sizzling cast iron plate, the Beef Yakisoba ate both good and bad. I grabbed some noodles from the top of the dish and it was chewy and mildly seasoned with a sweet glaze. Furthermore, the thin slices of beef were cooked just right being tender and buttery. Viv ended up with the caramelized noodles on the bottom and they were far too sweet and greasy. Since they had absorbed the excess sauce, the noodles were rather soft as well. 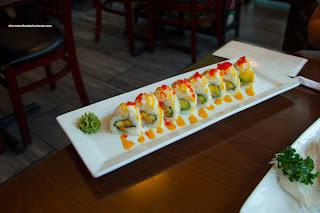 Our specialty roll for the meal was the Canada Roll with spicy tuna, mango and avocado topped with imitation crab and tobiko drizzled with mango sauce. The flavours were good with ripe tangy mango, smooth avocado and mildly spicy tuna, yet the rice was a touch soft and too sweet. While we were dining on the food, it occurred to us that the prices were not too far off from Sushi Garden. 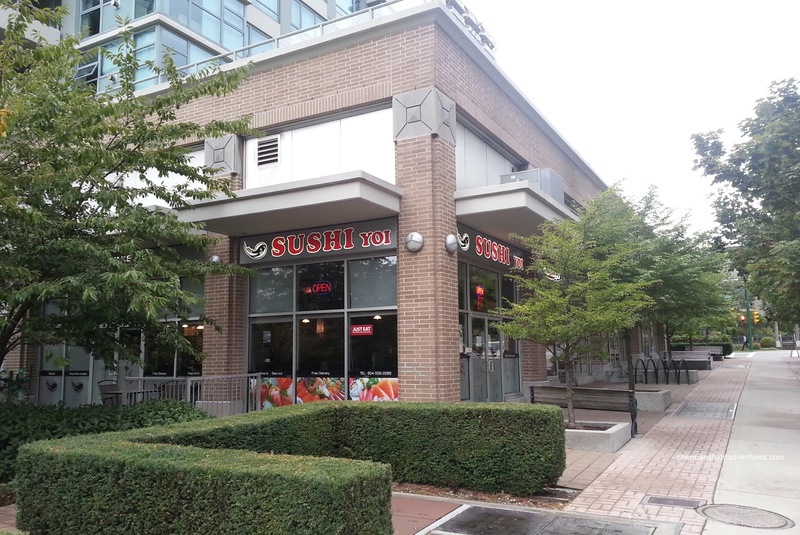 In that case, if one wanted acceptable inexpensive Japanese food, Sushi Yoi is an alternative to the nearby Sushi Garden. - Well, of course it ain't authentic, what did you expect?